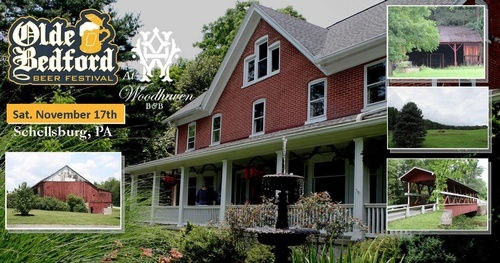 Building on the success of the inaugural Olde Bedford Beer Festival, which sold out in 2017, the Chamber is pleased to present the 2018 event: Saturday, November 17th on the beautiful grounds of Woodhaven Bed and Breakfast in Schellsburg, PA.
Woodhaven is an historic property located next to the Colvin Covered Bridge and near Shawnee State Park. The beautiful Bed & Breakfast, newly-opened by Dan and Bryn Keller features three guest rooms all with private baths, as well as 15 acres of grounds where dozens of craft beers will be available to taste, with the backdrop of spectacular fall colors at their peak. Festi vities kick off with a VIP reception at noon sponsored by Knisely and Sons, featuring tastings from Olde Bedford Brewing Company and delicious appetizers by Wholesome Living Marketplace. Tickets for the VIP function are $65 and are limited to 100 guests; very few are still available. Gates open to General Admission ticket holders at 1pm. GA tickets are $50 each. 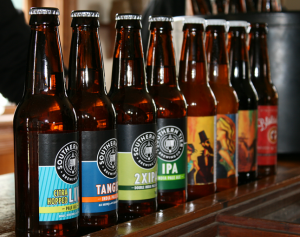 Guests will enjoy food tuck fare, vendor shopping, souvenir tasting glasses and event t-shirt (for purchase.) A shuttle from Bedford will be available, with pick-ups at the Fort Bedford Inn intersection and the Bedford County Fairgrounds. Parking will be available on the festival grounds as well. 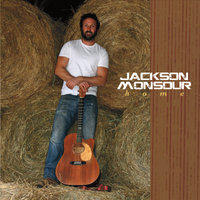 Music by Jackson Monsour will provide the soundtrack for the day, thanks to entertainment sponsor CenturyLink; REI will provide campfires and s’mores and Shaffer’s Bottled Gas will offer additional spots to warm up in the event of chilly fall weather. Special thanks to supporting sponsors Juniata Beverage, Clark Contracting, R&T Stone, Golden Eagle Inn and and media sponsor WJAC-TV. Additional sponsorships are now available for the Olde Bedford Beer Festival; the Chamber is also accepting additional food trucks and other vendors for the event. For more information on getting involved, or to order tickets via phone, please contact Rick Smith at 814.623.2233.